Gary Hoare threatens to try science on stage! Photo by Marshall Goff. 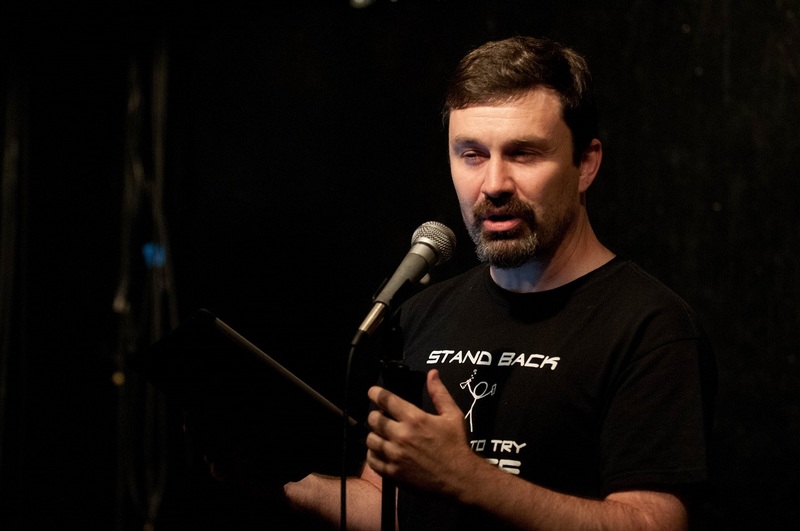 Gary Hoare was born in Massachusetts in 1970 and has been performing poetry since 1998. He has competed in the National Poetry Slam for teams from Worcester, Mass. and Providence, R.I., and has performed with Dr. Brown’s Traveling Poetry Show. He received a 2005 Jacob Knight Award for Poetry, and is the author of several chapbooks such as Fallback Crush and Awkward is Hot. His short films, “Sagittarius,” “Reminiscing about the Mars Landing” and “Harikikigaki,” appeared as part the Encyclopedia Show: Somerville. “Reminiscing…” was awarded the Here Kitty Kitty Prize, and his short film “Cat” (directed by Joe Cronin) was awarded Best Smartphone Production at the 2015 Rabbit Heart Poetry Film Festival. Gary received his Bachelor of Fine Arts degree from University of Massachusetts Amherst and works as a graphic designer. Additionally, he provides graphic design services to the Boston Poetry Slam, including the design of the show’s current logo (created in 2006 and revised in 2008), the Head-to-Head Dirty Haiku Slam, the Box of Doom, and the Star Trek vs. Star Wars slam. Gary also produced the logos for the 2011 and 2013 National Poetry Slams hosted in Boston. Gary currently lives in Worcester where he writes, performs spoken-word poetry, and paints. Some of his artwork can be viewed at garyhoare.com and redbubble.com.